Mix flour, baking powder, salt, cinnamon and spice in a bowl. 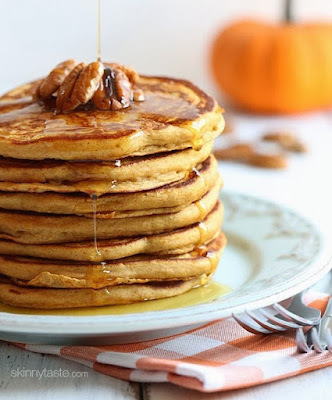 Combine buttermilk, egg whites, canned pumpkin, 1 tbsp maple syrup, oil and vanilla in a bowl and mix until smooth. Combine wet ingredients with the dry and mix well with a spoon until there are no more dry spots then fold in pecans. Heat a large skillet on medium-low heat. Spray oil to lightly coat and pour 1/4 cup of pancake batter. When the pancake starts to bubble and the edges begin to set, about 2 minutes then flip the pancakes and cook an additional 1 1/2 to 2 minutes. To serve, top with warmed maple syrup.